Demba Ba's late penalty for Besiktas denied Tottenham their first win in Group C of the Europa League. The ex-Chelsea man converted after Vlad Chiriches handled in the area having let the ball slip through his legs. 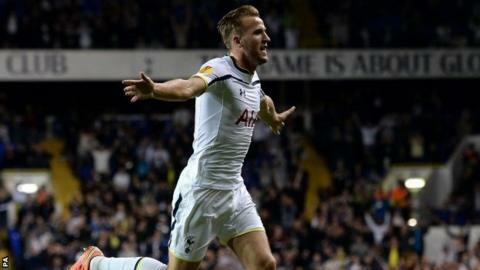 Harry Kane gave Spurs the lead in the 27th minute when he surged forward before firing a low shot past keeper Tolga Zengin from the edge of the area. Spurs keeper Hugo Lloris twice denied Olcay Sahan with brilliant saves, before tipping over an effort from Ba. Both Besiktas frontmen were a constant menace for Tottenham, who were lucky not to lose to Slaven Bilic's Turkish side. The former Croatia manager would have been frustrated by the failure to secure a first group win and by the exceptional keeping of stand-in skipper Lloris. The France international saved Spurs on three memorable occasions. He used his foot to divert Sahan's goalbound effort wide and then sprung off the turf to tip over the striker's loaded drive. His skills were then tested when he pushed Ba's fierce close-range half-volley over the bar. Lloris was finally beaten with a minute of normal time remaining, no thanks to team-mate Chiriches. A ball played for Sahan went under the Romania international's legs before he handled. The Senegal international stepped up to take the spot-kick, stuttered on his run before planting his effort past the Tottenham number one. It was his fifth goal in six appearances against the north London side. Besiktas, second in the Turkish league, were more potent in attack than their counterparts. They managed 24 efforts on goal as opposed to six for Tottenham, who only had three on target. Tottenham have found the back of the net in each of their last 13 European games (including qualifiers) at White Hart Lane. One of those came from the boot of Kane. The under-21 international once again highlighted his potential with a superbly taken goal in the first half. Having picked up the ball from Nabil Bentaleb, the forward turned his marker then drove forward before guiding a low shot into Zengin's bottom-left corner. Kane, who looked far more threatening than struggling frontman Roberto Soldado, also had a low angled drive saved by the Beskitas keeper at his near post. The result means Tottenham have only two points from their first two group matches. Their next opponents are Group C leaders Asteras Tripoli. Tottenham manager Mauricio Pochettino on Chiriches's error: "In football you can always make a mistake. It was an unlucky action, a difficult action in this moment. "He made one mistake after another mistake, but we need to accept it because this is football. "I am very disappointed, I am angry, I am frustrated, but it is 1-1 in the end. "We conceded in the last minute, which is very disappointing, and maybe frustrating. It is hard to accept this." Match ends, Tottenham Hotspur 1, Besiktas 1. Second Half ends, Tottenham Hotspur 1, Besiktas 1. Attempt saved. Oguzhan Ozyakup (Besiktas) right footed shot from outside the box is saved in the centre of the goal. Assisted by Demba Ba. Attempt saved. Demba Ba (Besiktas) left footed shot from outside the box is saved in the centre of the goal. Attempt blocked. Demba Ba (Besiktas) right footed shot from outside the box is blocked. Assisted by Kerim Frei. Attempt missed. Emmanuel Adebayor (Tottenham Hotspur) header from the centre of the box misses to the left. Assisted by Mousa Dembélé. Goal! Tottenham Hotspur 1, Besiktas 1. Demba Ba (Besiktas) converts the penalty with a right footed shot to the bottom right corner. Vlad Chiriches (Tottenham Hotspur) is shown the yellow card for hand ball. Penalty conceded by Vlad Chiriches (Tottenham Hotspur) with a hand ball in the penalty area. Attempt missed. Demba Ba (Besiktas) header from the centre of the box is just a bit too high. Assisted by José Sosa with a cross following a corner. Corner, Besiktas. Conceded by Hugo Lloris. Attempt missed. Tomas Sivok (Besiktas) header from the centre of the box is close, but misses to the right. Assisted by José Sosa with a cross following a corner. Corner, Besiktas. Conceded by Federico Fazio. Attempt blocked. Pedro Franco (Besiktas) right footed shot from outside the box is blocked. Assisted by Demba Ba. Corner, Besiktas. Conceded by Vlad Chiriches. Substitution, Besiktas. Kerim Frei replaces Gökhan Töre. Substitution, Tottenham Hotspur. Emmanuel Adebayor replaces Roberto Soldado. Corner, Besiktas. Conceded by Roberto Soldado. Attempt blocked. Oguzhan Ozyakup (Besiktas) right footed shot from outside the box is blocked. Attempt saved. Demba Ba (Besiktas) left footed shot from the centre of the box is saved in the top centre of the goal. Assisted by Oguzhan Ozyakup. Attempt blocked. Andros Townsend (Tottenham Hotspur) right footed shot from outside the box is blocked. Assisted by Nabil Bentaleb. Attempt missed. Mustafa Pektemek (Besiktas) header from the centre of the box is just a bit too high. Assisted by Gökhan Töre with a cross following a corner. Substitution, Besiktas. Mustafa Pektemek replaces Olcay Sahan. Corner, Besiktas. Conceded by Eric Dier. Attempt saved. Harry Kane (Tottenham Hotspur) right footed shot from the centre of the box is saved in the centre of the goal. Assisted by Ben Davies. Offside, Besiktas. José Sosa tries a through ball, but Demba Ba is caught offside. Substitution, Besiktas. Oguzhan Ozyakup replaces Veli Kavlak. Substitution, Tottenham Hotspur. Mousa Dembélé replaces Benjamin Stambouli. Attempt missed. Olcay Sahan (Besiktas) right footed shot from the centre of the box is close, but misses to the left. Assisted by José Sosa with a cross. Attempt missed. Demba Ba (Besiktas) right footed shot from the centre of the box misses to the right. Assisted by José Sosa with a cross. Substitution, Tottenham Hotspur. Aaron Lennon replaces Paulinho. Attempt missed. Nabil Bentaleb (Tottenham Hotspur) left footed shot from the left side of the box is close, but misses to the right. Assisted by Roberto Soldado following a fast break. Attempt blocked. Veli Kavlak (Besiktas) left footed shot from outside the box is blocked. Attempt missed. Ramon (Besiktas) left footed shot from outside the box is high and wide to the left following a corner. Attempt saved. Olcay Sahan (Besiktas) left footed shot from the centre of the box is saved in the top right corner. Assisted by Demba Ba. Hand ball by Olcay Sahan (Besiktas). Attempt missed. Andros Townsend (Tottenham Hotspur) left footed shot from outside the box is close, but misses the top left corner. Assisted by Benjamin Stambouli. Attempt blocked. Paulinho (Tottenham Hotspur) right footed shot from outside the box is blocked. Assisted by Benjamin Stambouli.